On May 24th, 2012, we announced the midnight showing of the time travel entry in the comedic aliens among us franchise. 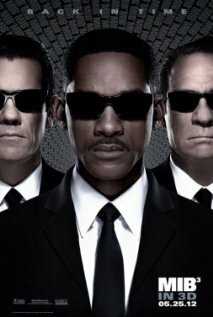 The third feature film in the Men in Black franchise officially debuts in the United States of America tomorrow, May 25th, 2012--which means that in many areas of this country there will be 12:01 AM showings of their first foray into time travel. European audiences have already given high marks to the film, released there within the past few days. According to press releases, an alien has tampered with the past, assassinating K in the 1960s when MIB was first getting started, and J must travel to that historic decade to correct history. While the idea reeks of temporal disaster, it is also filled with comedic possibility. Again the covert operatives J and K are played by the conveniently anonymously-named Smith and Jones. Josh Brolin is charged with playing the younger Tommy Lee Jones character in the past. Several other familiar faces, including Rip Torn as Zed, are joined by newcomers including Agent Oh in Emma Thompson's older and Alice Eve's younger versions. The pleasure of the Men in Black franchise has always been that everything is absurdly ridiculous and the characters treat it as not merely serious but perfectly normal. Their take on time travel is expected to be similarly nonsensical but fun, and we look forward to being able to bring a full temporal analysis of Men in Black III to these pages soon.